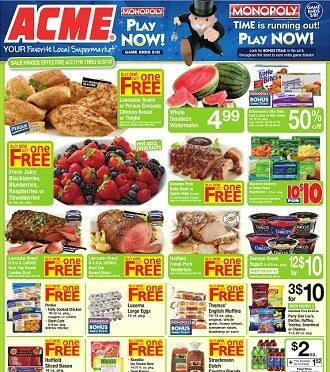 Browse the current Acme Weekly Ad, valid April 19 – April 25, 2019. Don’t miss the Acme Specials and bakery deals & promotions from the current Ad Circular. Shop and save with the Lancaster Brand Grade A Fresh Turkey, Lancaster Brand Premium Spiral Sliced Ham, Cracker Barrel Cheese, Entenmann’s Baked Goods, Maxwell House Coffee, Planters Peanuts, Kraft Shredded Cheese, Cool Whip Topping, Stouffer’s Single Serve Entrées, O Organics Pure Maple Syrup, Starbucks Coffee, Osem Mediterranean Pickles, Nature Made Vitamins, Dove or Degree Invisible Solid Deodorant.